Running a jailbroken iPhone on iOS 4 / 4.0.1 and having problems running Skype to its full potential? Well you don’t need to worry now. A new MobileSubstrate package has just been released in Cydia which fixes all issues that you maybe having running Skype on a iOS device which is jailbroken using the newly released JailbreakMe 2.0. To fix the issue, simply start Cydia and and apply all the updates, including that of MobileSubstrate version 0.9.3226-1 to run Skype with full multitasking support in iOS 4. With @comex’s jailbreak out and behind us, I’m back on fixing duty: new MobileSubstrate fixes Skype redux and Cyntact is in high resolution. I don't see Mobile Substrate, what's the Repo? Perfect, I just tested on my iphone 3G and worked like a charm, background and everything. Thanks. AMAZING tool. I couldn't imagine anything easier than it to jailbreak my phone. Brazilians thank u all guys. I just jailbreak iOS 4.0 on my iphone 3GS. I'm afraid of upgrading to the iOS 4.0.1 and have problems to jailbreak it. is the bar issue the only difference between iOS 4.0 and iOS 4.0.1? Now, all they need to do is fix the Maps app. Jailbreak causes the Maps app to freeze if you try to change settings. I installed the newest Mobile Substrate via Rock rather than Cydia. I assume that makes no difference to using Skype, right? open cydia and go to changes, it should be there on top of the page. i couldn't see it before either, but i just checked cydia and the updated appeared for me under the 'changes' button. Nice one, worked a treat. It happend to me also. 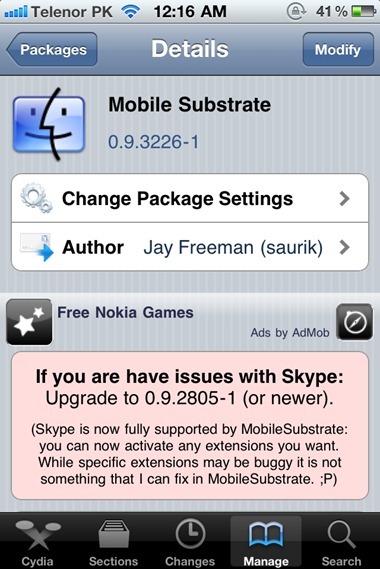 I installed the latest mobile Substrate 0.9.3228-1 but Skype is still not running in the background. It signs-in each time i re-open from the multitasking bar. When I load the new Mobile Substrate I loose a few things 1) I no longer have the Cellular Data Network menu in Network 2) The APN must be changed in this menu as I can't access the internet via 3G .. I have to create a profile setting the APN using the iphone configuration ultility 3) I have lost /Root Directory/var/mobile/Library/Carrier Bundle.bundle directory .. manually adding it back doesnt use the carrier.list in this directory 4) MMS has disappeared …. I have a problem with the multitasking, i found out after install Winter Board, my i double tab home button my Multitask drawer end up emty, kind of buggy..
Any other way to fix this buggy? Great!!! Somehow it seems to have fixed my live messenger too…. My Maps app is also freezing. I use this all the time and really need a fix. Are most people experiencing this issue or just a few of us? Any known updates/fixes?? I spent hours pulling out my hair trying to figure out why it wasn't working when i upgraded mobilesubstrate. Although it was mentioned earlier, I will state it again in case there are any others like me who overlooked it the first time: you MUST remove rock app before upgrading mobilesubstrate and reinstalling skype. Do those two things before reinstalling Rock. I have now got all my old rock apps up and running and skype is fixed. See the post below – removing Rock solves the problem. See post about removing Rock app. I worked. Removed Rock, uninstalled Skype, reboot, reinstalled mobile Substrate 0.9.3228-1 (in my case or just upgrade), reboot, install skype, install Rock & You are good to go! Also remove Rock Extensions if you have those installed separately. Even after going through all the steps below, Skype still crashed in the background until I did this.